Are you a beginner shooter? Then you might have heard of an SOB holster. It simply means small of back holster. If you are into concealment carry, then you are going to love this holster. One look at it and you’ll know for sure that it is meant for an incognito weapon carry. The gun sheath usually stays around your lower back, allowing your gun to always stay undetected when approaching your target head-on. Other than that, a holster looks cooler around the back than at the side to some people. So, if you’ve never used an SOB gun sheath before, it’s about time you get one for yourself. However, you have to make sure that you get value for your money. The last thing you want is your gun falling off your back in a shoot-out or during a match. Therefore, ensure you go for something reputable and reliable. Remember; once you go “back” you never go back. Pun intended. Since you have decided to use back holsters, you need to know that finding one is not as easy as it sounds. Luckily for you, below are some of the top small of back holsters ever made in history. Deciding to use a small of back holster as opposed to the traditional side waist holsters may be one of the best decisions you ever made. You won’t regret it. Picking one could turn out to be quite challenging. The number of SOB holsters is just too many out there. Apart from that, there are also too many brands to choose from. This can be a bit overwhelming. Not to worry though. Your work just got a whole lot easier. With the following comprehensive summary, you will get to know the top 5 small of back holsters in the world. This gun holster will give you more value than it is actually worth. First of all, you need to know that the Outbags LOB3S is handcrafted by highly skilled craftsmen. Owning it will mean you get to have uniqueness and supreme quality in one holster. Besides that, this gun sheath is made from hard molded leather. Therefore, it is both strong and sturdy. You can be sure your weapon will always be held securely in place by this holster. Don’t forget how durable that leather is too. It can last you quite a while if well taken care of. Furthermore, the holster is hand dyed so that it maintains its natural properties and preserves its new look over a longer time. One issue you might have is that the sheath runs a little deep on your waistband, so getting a good grip on your gun handle may be a bit difficult in emergency situations. If you are into nylon holsters, then this is what you want to get. The Barsony SOB holster has been made using state of the art cordura nylon that is held together by precision stitching. 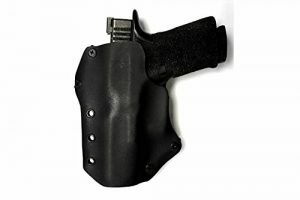 This makes the holster tough and sturdy enough to firmly hold your gear. Although the nylon is tough, it is thin and has been engineered with a compact design. This makes the holster lightweight and convenient to move around with. Moreover, it has a suede lining on its exterior that ensures it stays well attached to your waist band. On top of that, the sheath has a steel clip attached on a leather backing on its sides that ensures the same. Finally, the holster has an internal moisture barrier that makes sure your gun isn’t subject to perspiration. However, the sheath may not firmly hold your 9 mm as you expect it, since it is a bit large. This holster is a little cheaper than the Outbags holster, the Pro-Tech holster is made of nylon that is double stitched at pressure points for more firmness and sturdiness. With this holster, you can be certain your weapon will never fall off under any circumstance. Apart from that, the gun sheath has all its edges bent to prevent it from wearing out. Thanks to its strong metal clip, this holster will stay steady and upright on your waistband at all times. Furthermore, the clip can change sides, allowing for both left and right hand side use. Besides that, the Pro-Tech SOB holster is small, simple and strong and this makes it a suitable option for everyday carry. It is also open-ended to allow for fast and smooth draws. Despite that, the bottom of the gun might feel uncomfortable on your skin, especially when it’s hot. So, remember to wear an undershirt. Leather will always have an edge over its nylon counterpart any day and any time. That’s what makes this holster worth your money. Not only is it very strong with unbeatable tensile strength, but it is also durable and will certainly last you a number of years if well taken care of. After all, it is made of U.S double shoulder 7 oz. weight cowhide that is held together by precision stitching. The leather is also lightweight and compact for more convenience. Additionally, the Barsony Leather holster comes with a mag pouch for extra ammo capacity. Apart from that, this sheath will fit belts of up to 1.75” wide. This allows you to wear it on most of your belts. Moreover, since it has no retention straps, you can be able to attain maximum draw speeds. However, the leather could seem a little too soft with a moderate to low retention. This holster is so far the most expensive option on the list. However, it is totally worth it. With a super strong Kydex hand crafted in the US, the Advanced Performing Shooting holster is more than capable of securing your weapon in place. It has great retention and firmness. Furthermore, the Kydex makes it almost unbreakable even under maximum stress. One outstanding feature you might like about this SOB gun sheath is its design. Although it is plain looking, it has that special touch that keeps you wanting to stare at it even more. Besides that, the holster is open ended in order to allow you to access maximum draw speeds during your shooting experience. It is also comfortable on the back and doesn’t dig in to the skin, making it suitable for every day carry. The only issue you might have with this sheath is that it doesn’t have many color options. Black is the only stock color. Well, now that you know the top 5 small of back holsters, it’s time to make your decision. If you prefer leather, then the Barsony Brown Leather SOB holster should be what you need to consider. However, if you want something reinforced with Kydex, then the Advanced Performance Shooting holster wouldn’t be that bad. What’s important here is that you select the option that suits you best. Take your time and weigh your options using their pros and cons. Once you have made your selection, locate it on Amazon. It is undoubtedly one of the most reputable and reliable shopping platforms of the 21st century. When you find your choice, remember to skim through customer reviews and read product details more information. This will help you make a more informed decision. What are you waiting for? Start shopping now!